Entrepreneurial students from the University of Southampton have set up a new project to improve standards of living and future economic opportunities in rural African communities, by replacing kerosene with solar lamps. The Right Light project has been established by Southampton SIFE (Students in Free Enterprise), a student run social enterprise and an affiliated society of the University of Southampton Student’s Union. The aim of the project is to increase the use of solar lamps to improve health and education standards and to reduce family expenditure therefore increasing their disposable incomes. Kerosene lamps have been the traditional source of light in rural communities across the developing world. However, the lamps emit toxic fumes that affect respiratory health, provide poor quality light, and offer no opportunity for income generating activities. Kerosene is also expensive, at times accounting for a third of a family’s expenditure, and on a global scale, kerosene lamps emit 100billion tonnes of CO2 each year, each one emits 0.2tonnes – about 1,000miles in a small petrol car. Solar lamps offer a solution to this problem, but at a cost of £12 they are unaffordable for many communities, who may only earn £8 a month per family. Right Light addresses this by implementing a micro-credit model, where families pay 10 per cent of the cost in the first month followed by weekly repayments of 20p over the remaining 12 months. The project has been trialled with 93 families across three communities in Madagascar; reducing their family expenditure by 10 per cent, helping 408 children learn better at night and improving the health of 75 per cent of family members. It is now also starting two entrepreneurs who can rent the lamps out on a nightly basis. By increasing investment in the communities, the project encourages business creation and income generation, allowing the communities to all achieve greater living standards. Michael Austin, second-year Geography student and founder of Right Light, says: “Right Light is innovative as it brings together microfinance and a product that is already capable of changing lives. Microfinance has traditionally been based around helping individuals grow their business and not to enable them to afford products that either save or generate money: this is what Right Light supports. The fact that it is not the microfinance industry or solar lamp manufacturers, who have made this first step but university students thousands of miles away, is perhaps innovative in itself. 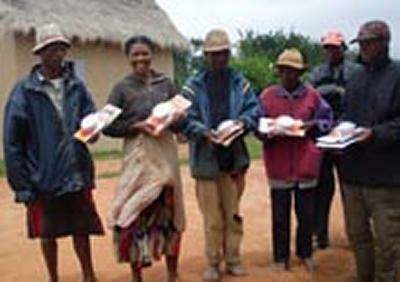 The students have been working in partnership with Feedback Madagascar, a UK based NGO working in Madagascar, who have performed needs assessment surveys, teaching of education packs, selling of lamps and collection of repayments, all central to running the project. The students have also been working in partnership with solar lamps manufacturer Tough Stuff, who provided the lamps and advice on their use.